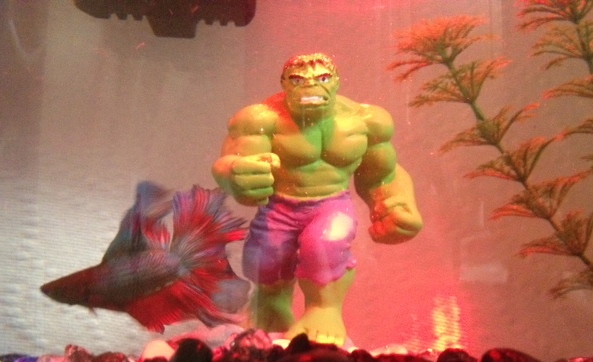 The Marvel fish tank ornament line is available at Petsmart, who have been producing a ton of Marvel themed pet accessories lately including dog clothing, frisbees, and scarves. 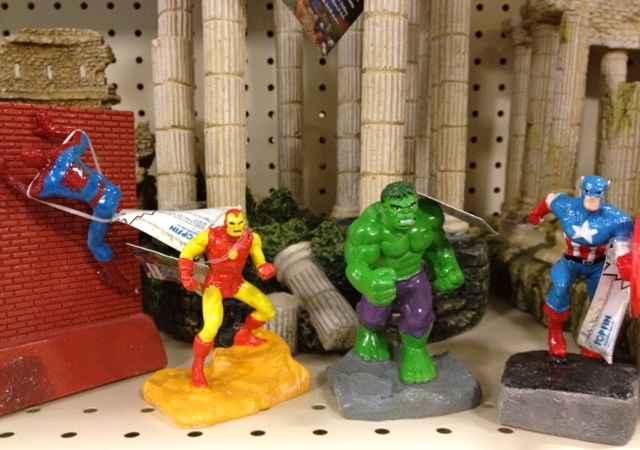 They had four individual characters on the shelf priced between $7.99 and $9.99 including Hulk, Spider-man, Captain America and Iron Man. They also had a $14.99 piece that featured both Spider-man and Captain America on it. Across the board the paint applications on the ornaments is pretty bad. Most noticeably on Hulk and Spider-man’s eyes as well as Captain America’s shield. As I’ve made very clear in previous volumes of this column, I’m not a fan of Marvel in general, but I cannot get enough Hulk and Captain America. As a result, those ornaments seemed like automatic buys. Upon further inspection, however, I realized in addition to lacking an “A” on his forehead and having a poorly painted shield, one of the Caps was missing a fist and the other had a chunk missing from his chin. I just couldn’t bring myself to buy either of these particular damaged ornaments. (I do reserve the right to buy one later that’s in better condition, however.) 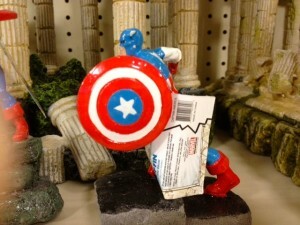 It kind of amazes me that paint applications on the tiny Heroics figures Captain America shields are so superior to what was produced at this larger scale. If you look closely enough you’ll notice the Cap pictured above is the one that was missing his hand. 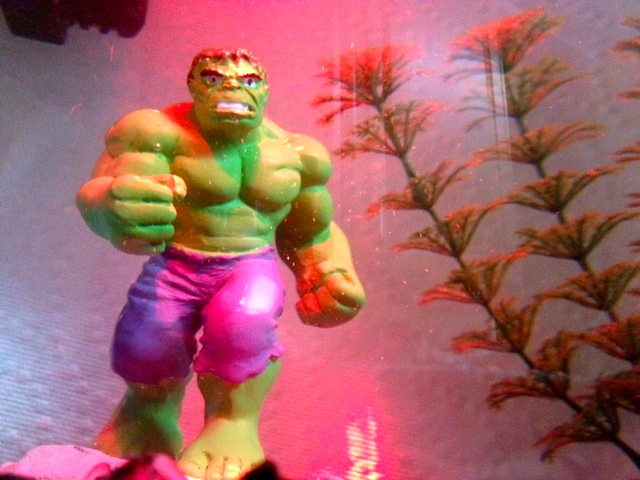 In the end I did buy one of the giant-eyed Hulks. What can I say? I’ve been a sucker for the character since I was like five. Overall, besides the terrible eyes I really like the sculpt. It reminds me of how Hulk was drawn in the 1960s. What surprised me, however, was how much more I liked the ornament once it was in the fish tank. Under the lighting, the color of Hulk’s skin and pants just seemed better. The glass and the water distort his appearance so his eyes don’t bother me nearly as much. 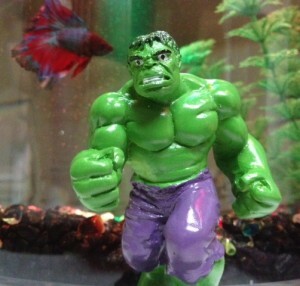 He seems ready to smash his tankmate at any time. 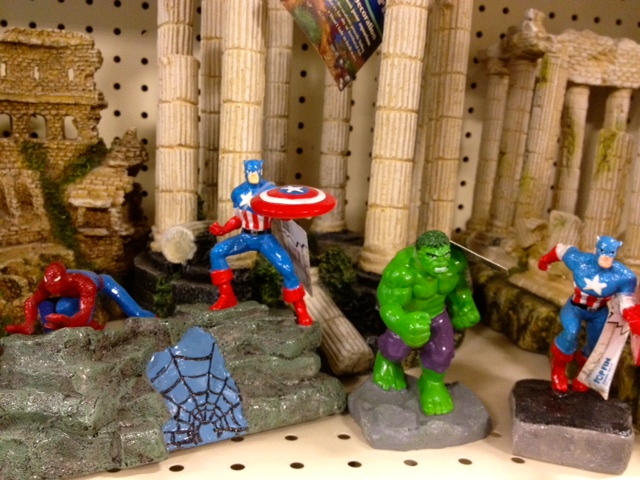 For some reason Hulk and Spider-man were both priced at $7.99, while Cap and Iron Man were $9.99. There appears to be no real logic behind that pricing model, especially considering Spider-man comes with the large wall that he’s climbing on. I’m working under the assumption that it’s a mistake that will be rectified shortly. To conclude, there’s no denying these things are stupid and that there is no legitimate reason why you’d find Iron Man or Captain America hanging out at the bottom of a fish tank or any other body of water. It also is a huge missed opportunity that they chose not to produce a Namor ornament – even though most people wouldn’t recognize him. If, however, in addition to being a comic nerd, you also happen to be kind of a fish nerd, I’m not sure how you can possibly resist these dumb things. Now somebody make some Aquaman aquarium ornaments already! KevinMLD has spent the last nine years working strange jobs that no one understands. He’s a miserable grad student who likes watching free movies and resents how expensive comics are now. He plays bass in the band Bleed Radio Bleed who should have a full-length out on Break Even Records, which makes them officially unknown artists.